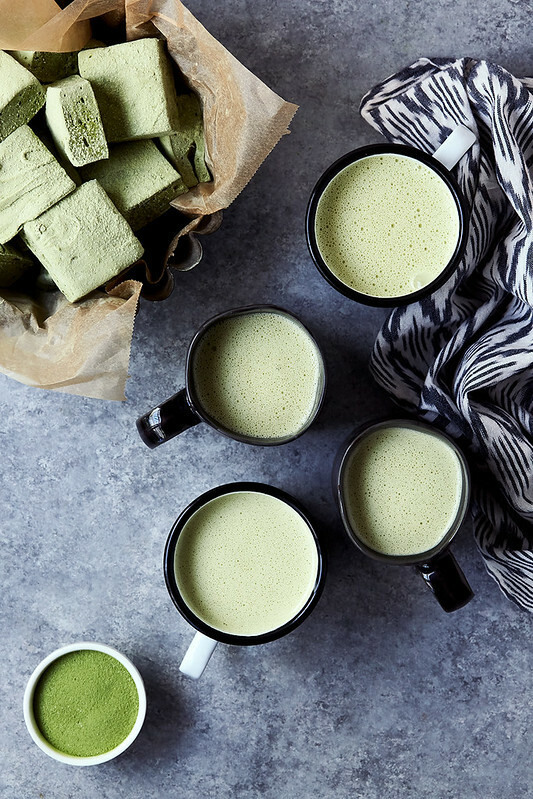 This Paleo Matcha White Hot Chocolate is a cozy, winter dream come true. 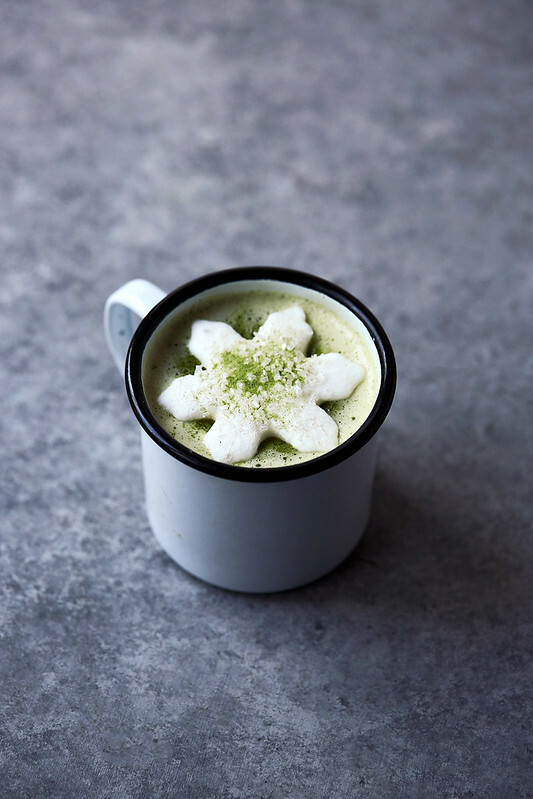 Frothy, luscious white hot chocolate meets a classic rejuvenating matcha latte, with all kinds of nutritious, superfood goodness you can feel good about – from antioxidants to healthy fats plus healing, immune-boosting, gut-healing collagen, if you wanna include it. 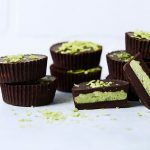 It’s paleo and dairy-free, with options for keto and vegan! 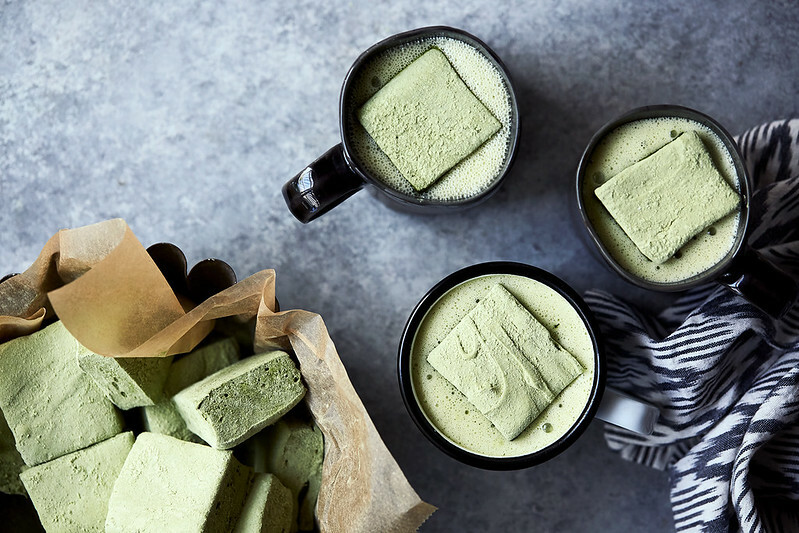 The maple-sweetened paleo matcha marshmallows on top, those are totally optional, but listen – don’t be stupid! 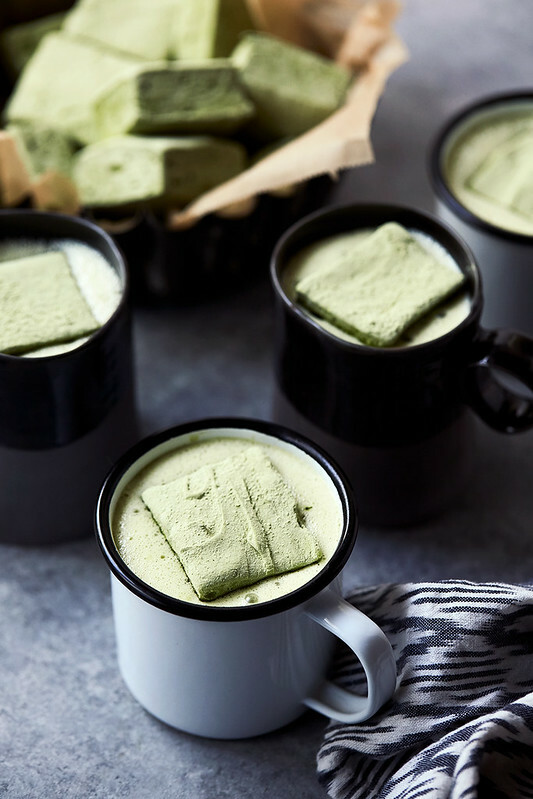 This Matcha White Hot Chocolate is practically a superfood tonic disguised as a treat! 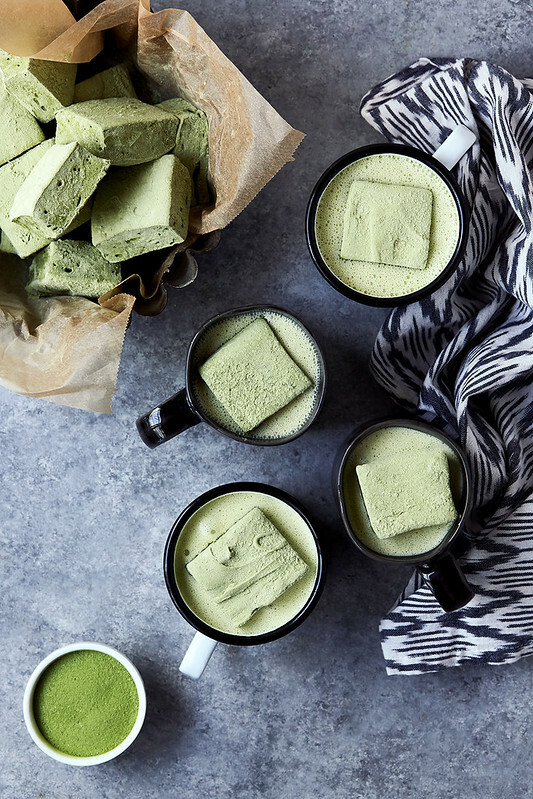 First and most importantly, this delightful, healthful treat features Vital Proteins brand new Matcha Collagen. Antioxidant rich matcha tea, can help fight free radicals in the body and promote long-term health. 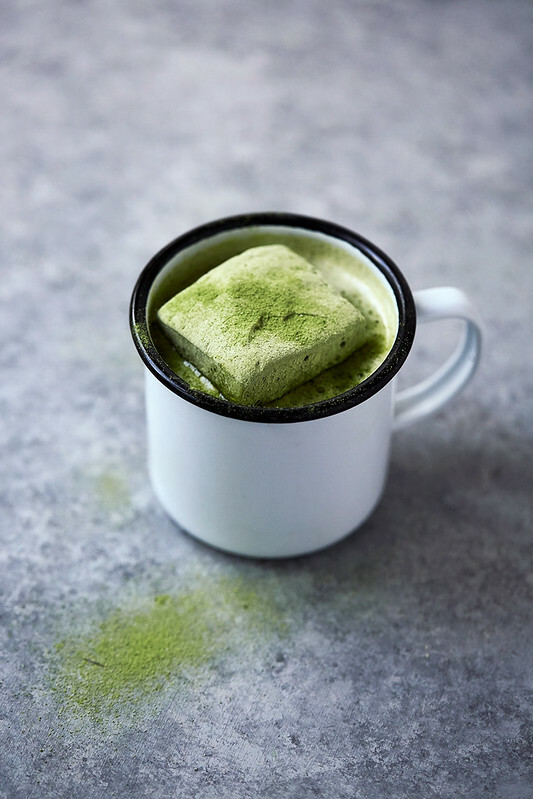 Matcha being the whole leaf, ground, also contains 137 times the amount of free radical-fighting antioxidants as any other green teas. 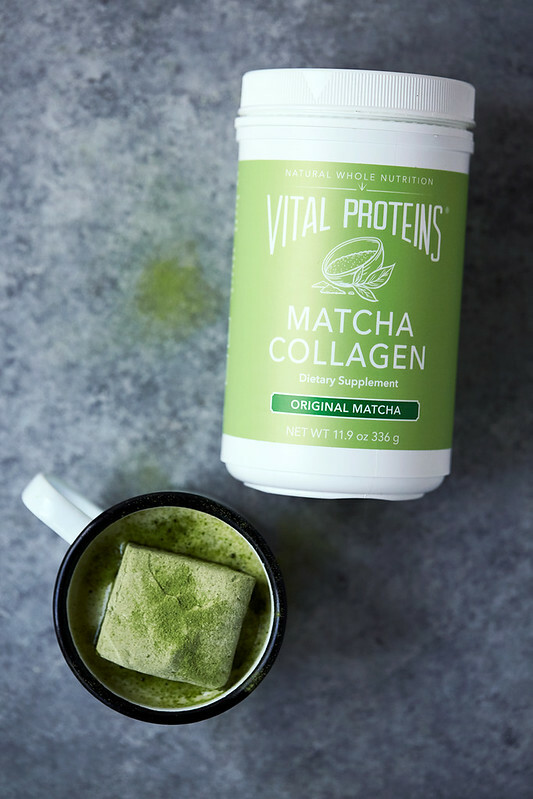 The matcha is combined with high-quality grass-fed collagen which promotes bone, joint, and skin and digestive health. 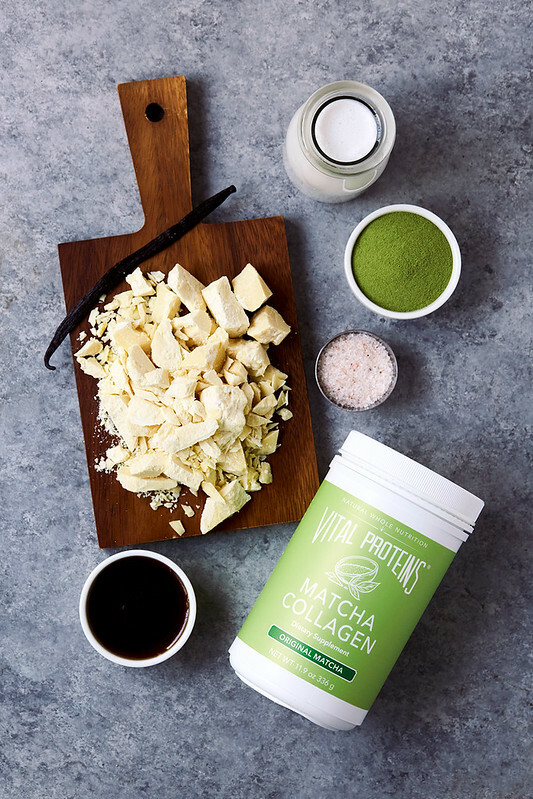 Collagen is the most abundant protein in the body and is responsible for supporting, healing and sealing the gut plus maintenance of healthy connective tissues, such as bones, joints, skin, hair, and nails. Read more about the benefits of collagen here. Moving on to the other goodies. The white chocolate situation here is serious. To be fully transparent, I have never actually really been a fan of white chocolate, generally I found it to taste mostly like white waxy sugar. I never really got much flavor from it and it was always overly sweet for my taste. Earlier this year I started purchasing raw, cacao butter in bulk, to make my Homemade Dark Chocolate Bars and White Chocolate Peanut Butter Fat Bombs and I have become obsessed with what a lovely fat it is. It’s a highly stable fat extracted from cacao beans that has many fabulous uses both for eating and for personal care products, like homemade body creams. 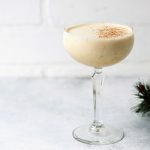 It’s silky, creamy, melt-in-your mouth texture and delicate aroma makes it a really nice addition to a fatty Boosted Coffee, smoothies and many other things. Cacao butter is a high-antioxidant food, as it contains a significant amount of polyphenol and flavanoid antioxidants, it’s also rich in omega-6 and omega-9 fatty acids. As always, with most of my recipes, when sweetening, the options are all yours and the sky is the limit for what you wanna do. You can use maple syrup or honey, use as much or as little as you’d like. If you wish to make this low carb / keto, opt for monkfruit, stevia or another sweetener that will not affect your blood sugar. You can also go completely without, if that’s your scene. 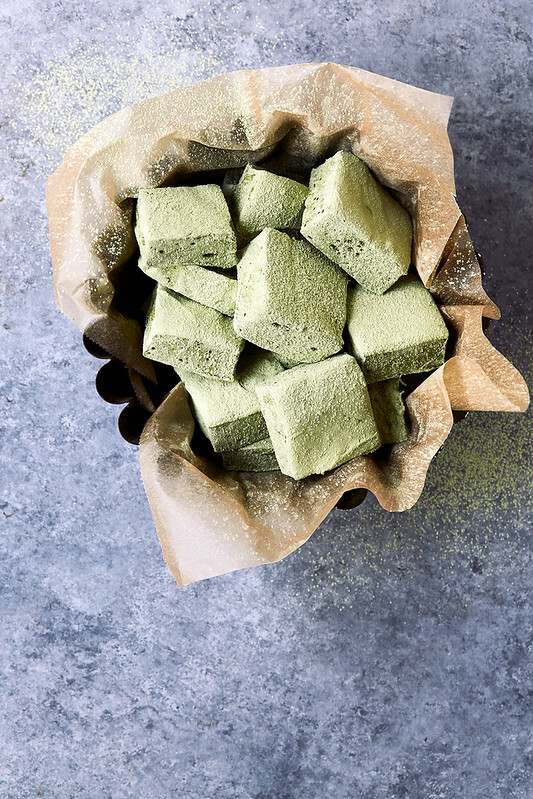 On the flip side, if you wanna go all out to maximize the treat factor, add the homemade matcha marshmallows (recipe below) or go with the cutest, most festive marshmallows you can find. 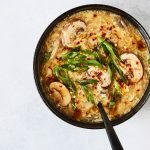 Add all of the ingredients to a medium saucepan over medium-high heat. Stirring often, bring to a boil then reduce to a simmer. Continue to simmer until all of the cacao butter is melted. You can serve as is, or blend in a Vitamix or with an immersion blend to make extra frothy. Top with a matcha marshmallow, if you'd like. Enjoy. 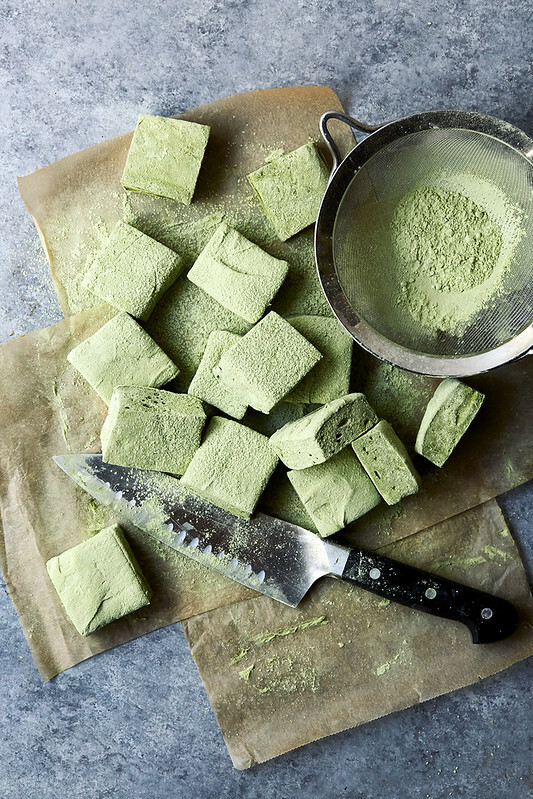 Mix together two teaspoons of matcha powder with about ¼ to ½ cup starch or powdered sugar. Set aside. 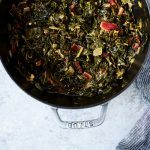 Grease an 8×8 pan (or any square or rectangular casserole dish or pan) and line with parchment paper. Two pieces going crosswise. Leave a little bit to hang over the sides of the pan and create flaps to be used as handles for removing your finished marshmallows later. Sprinkle the parchment paper with a light layer of the arrowroot starch and matcha tea mixture (or other coating of choice). In a large bowl or your standing mixer bowl, evenly sprinkle the Vital Proteins Gelatin over ½ cup of water. While the gelatin is blooming, pour the remaining ½ cup of water into a small sauce pan along with the maple syrup (or honey) and the salt. Turn the burner to a medium heat and bring the mixture to a boil. Place a candy thermometer in the sauce pan and continue to gently boil the mixture until it reaches 240ºF (the soft ball stage). This should take approximately 7-8 min. Immediately remove the sauce pan from the heat. Turn your standing mixer to low/med. Slowly pour the syrup mixture into the bowl of your mixer, combining it with the softened gelatin. Pour down the sides of the bowl, to avoid splattering. Turn the mixer to high and continue beating until the mixture becomes white and fluffy and about triples in size (about 10-15 min). 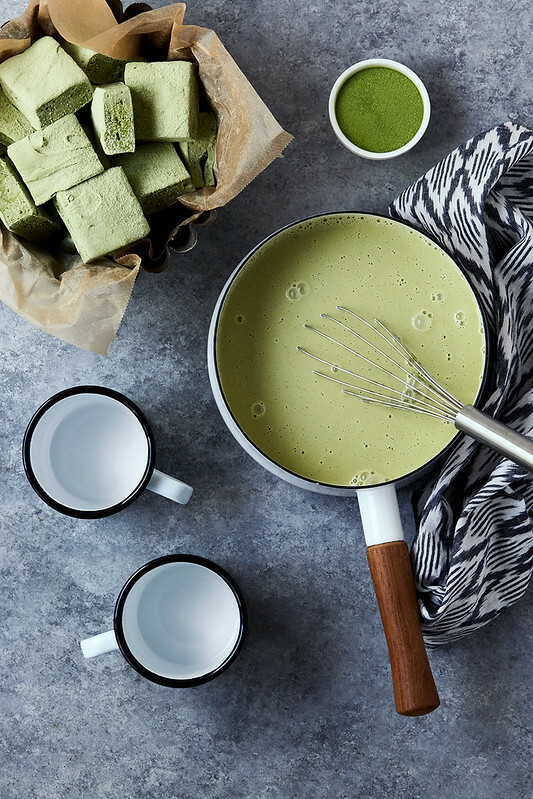 With the mixer on low, slowly add the remaining ¼ cup of matcha powder and vanilla bean powder (or extract) mix until completely combined. Turn off the mixer and using a rubber spatula, transfer the marshmallow creme to the prepared pan. Working quickly, smooth out the top with a pallet knife or back of a spoon. Sprinkle starch evenly over the top and pat down if needed. Leave the pan to dry out, uncovered, overnight. Let these set a minimum of 4-6 hours. When the marshmallows are set, remove by lifting using the parchment paper flaps. Carefully peel the paper away from the sides, dusting with additional starch if needed. Cut to desired size and shapes. Add more coating while you are cutting, as needed and toss them again in some starch once cut for a super nice finish. Adapted from The Urban Poser's Marshmallow recipe. Vital Proteins is a sponsor of Tasty Yummies. All content, ideas, and words are my own. Thanks for supporting the sponsors that allow me to create new and special content like this for Tasty Yummies. Ooh – I’m lovin’ it! This looks fantastic, Beth! Thank you for sharing! Can you substitute coconut cream for full fat Coconut milk? How? Sure, but it might make for a fairly thick final drink, so may need to add a little water, personal preference I suppose. Im sure it’ll taste amazing, though.